I don’t mean that cats write books. At least I don’t think so. There’s no knowing how much input authors’ cats have where books are concerned. Let me know. A while ago I was on a cat thread, and threatened to offer more on cats. While I’m searching for an elusive picture book (could it be we don’t actually own a copy? ), I’ll have a go at those who make the books happen, instead. I’ve noticed that writers very often write a lot about their cats on their blogs or websites or wherever. I feel I may know more about authors’ cats than authors’ children, which is as it should be. Children should be left alone, and not be embarrassed further, unless they are mine. Authors are more cat people than dog people, or perhaps that’s just how it seems. There are the lurchers belonging to Cathy Cassidy and Meg Rosoff. If it hadn’t been for them, I wouldn’t have known what lurchers are like at all, when one turned up in Linda Newbery’s Flightsend. I can’t recall any other literary dogs, right now. Lurcher in her book aside, I believe Linda is a cat person. And Cathy Hopkins keeps her fans updated on her cats. As do countless others. Nick Green even seems incapable of being photographed without one. I get the impression that the cats are the bosses, and any writing of books has to be arranged around the cats and their comforts. With Nick as the exception, I think it’s only female writers who talk about their cats. Or dogs. Why? Please write in and tell me. And if you happen to own an axolotl or anything else interestingly different, do let me know. I’ll continue the search for that cat book. Blog stats are fascinating. They are nearly as good as the phrases in search engines that get me my customers. I meant to keep a little list of the most amusing ones, but it appears to me now that maybe I forgot. Stats. My second most read piece is the Jacqueline Wilson interview. Not surprising, I suppose, as she does have a few fans out there, and it’s not a reflection on the quality of my writing. However, the most read piece is about me. Very flattering to come before Jacqueline. Third comes the piece with the graphic pictures of Artemis Fowl. And that sounds a lot ruder than it is. Stats for searches tell a different story. There the witch is sandwiched between the aforementioned Artemis in third place, and his good friend Holly Short, who comes top. Now why would people look more for Holly than they would the witch? Why do publishers think that there is going to be a new J K Rowling? And if there is, that they will be the ones to find him or her. It’s not a God-given right to have another publishing phenomenon, and if it was that easy, we’d have them all the time, and then it wouldn’t count as a phenomenon any longer. I wouldn’t mind more books like Harry Potter for me and others to enjoy, but I don’t need the circus that accompanied our favourite wizard. Why does Barry Cunningham think he’s going to find the new J K R? Because he found the first one. Still doesn’t mean he has more J K R finding talent than anyone else. I gather his Chicken House have set up a competition for new children’s writers, and I know I’m rather late gathering this. Last year’s competition already has a winner out of the 2000 books they received. Congratulations to Emily Diamand who won with her Reavers’ Ransom. I hope she does well, but having won only means that Chicken House is publishing her book, and hopefully that they’ll push it a little bit more than some books get pushed. Neither fame nor fortune is guaranteed. I’m guessing from what Barry wrote in the Times recently, that there is another competition this year. That’s good, and may provide a much needed break for someone. Though I have heard from someone in the know, that to make space for Emily and the next winner, Barry has given some of his existing authors the shove. That isn’t quite so good. So, maybe it’s not the next J K R we are getting, because she lasted for ten years before her series came to an end. Perhaps we are just getting an annual flash-in-the-pan. The piece in the Times ended with instructions for the aspiring hopefuls on how to write a good children’s novel. I think the potential winner already has it in them. What’s more, the ex Chicken House authors probably also know this, and they are still being chucked out. My source also worried about not being grumpy enough to qualify for possible J K R status. I’m sure it comes automatically with all those requests for money. Unless you’re a former Chicken House writer, in which case you can be grumpy for other reasons. I wish Eva Ibbotson had started to write her more recent style of children’s books a little earlier. The Dragonfly Pool is her latest book, joining the ranks of Journey to the River Sea and The Star of Kazan. I suppose the books are a little old-fashioned, but only in the best way. The Dragonfly Pool is the Prisoner of Zenda meets Lisa Tetzner’s “children from no. 67,” which isn’t surprising considering Eva’s Austrian background. She writes well about what she knows well, and the small kingdom of Bergania sounds lovely. Delderton is a most unusual boarding school, where Tally gets sent in the spring of 1939. No uniforms, and the children can do almost anything they want. In this case a group of them end up going to Bergania to dance for the King, except things don’t quite go according to plan. Tally befriends the young Prince Karil, and the story is a showcase for how children join together in friendship across borders, and the adventure turns from escaping the Nazis, to escaping bullying family members. It could be that this story is a little unlikely, but it is a very charming and lovely kind of unlikely, and it makes you feel good all over. There’s some nice humorous touches, but above all it is about solidarity. Mothers are funny. They like pictures of their children. They also like pictures of complete strangers that happen to look like their children. After Mother-of-witch died, I had some clearing out to do. Among the weirdest things I found, was a health type magazine with a photo of myself on a bicycle. For those who know me, this will sound very unlikely. I don’t think I had posed with a bike since about the age of eleven. But whoever the cyclist was, she looked just like me. And that must be why the magazine article was saved. When Daughter was about four, my friend came round some time in December. She looked at our Christmas tree and wondered why I had Daughter as an angel, hanging from a branch. When I looked more closely, I realised the angel was the spitting image of Daughter. I think she came from Ikea. Round about the time I knew Son would be going to Edinburgh, I came across his (almost) photo as an award winning bookshop manager in that beautiful city. I took that as a sign, and ordered Son to seek part time employment in this charming looking manager’s shop. Teenagers are slow, even when they look nice, but this week he started work there. And none of this makes any sense whatsoever. I know. But it’s warm, and none of you will read this anyway, because you’re all sitting on a beach somewhere. I want a bus like the one Eoin’s got! Have you seen the bus he’s currently travelling round America in? And that’s not the only thing that’s unfair. The Americans get the new Artemis Fowl before we do. (I know, I’ve already read it, but that’s not the point.) 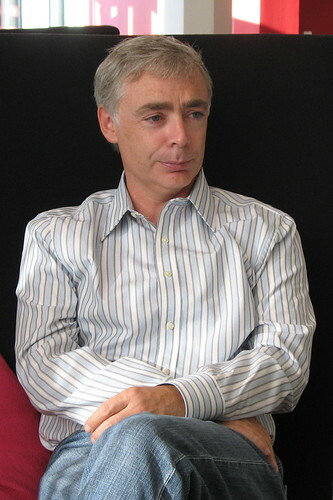 They also get Eoin Colfer before we do. He is touring the US for two weeks, in a bus, making a daily vlog as well. That’s how we know what it’s like. The bus. It’s wonderful. I want one. Or did I already say that? It beats a broom any day. Oh, to be a rich and successful writer. And I don’t even like travelling by bus. Being Algerian in Paris is harder than being a Scandinavian in Britain, but there are interesting similarities between Faïza Guène’s new heroine Ahlème, and the witch. The immigration office that Ahlème has to register at regularly, sounds rather like Lunar House in Croydon, and my experience of calling there isn’t much fun. It’s for second class people. 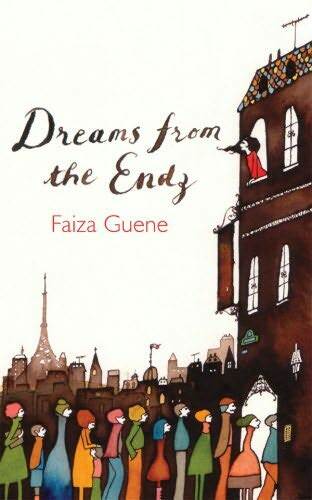 This new book by Faïza Guène, translated by Sarah Ardizzone, is as good as her first, Kiffe Kiffe Tomorrow. Dreams from the Endz isn’t as much of a teen book, though, and the publishers say they are only aiming it at adults, which is a shame. It’d be good if more teenagers could read it, and learn what it’s like to be an unwanted immigrant. Ahlème is both a typical 24-year-old modern girl, and a good Algerian daughter and sister, keeping her invalid father happy, and trying to keep her teenage brother out of trouble. She struggles to find a job to feed them, and she meets up with her friends and helps her neighbours, and she falls in love. And even love has to depend on the immigration authorities. Faïza is good at getting her message across, about what it’s like to be an immigrant in France. We need more books like this one, and it’s good to get a story from across the Channel. Very near, but very different. I nearly fainted when I saw the price of Dreams from the Endz. £11.99 for a paperback of 170 pages! I understand it will sell fewer copies, because it’s foreign, not so well known, and translations may cost more. But who in their right minds will pick this book in the shop, when the average paperback costs a fiver less? The risk here must be that the book flops, and that’s seen as proof that books like these don’t sell, so why publish any more.